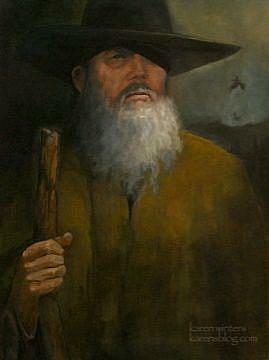 This painting of Wotan (Odin) features him in disguise as the Wanderer. A major character in Wagner's Ring Cycle, Wotan roams the world disguised as an old man with a long beard and ragged hat. He walks with a staff and has two ravens who accompany him. This painting was in conjunction with the Los Angeles Opera Company's presentation of Wagner's Ring Cycle, and was exhibited at the Cathedral of Our Lady of the Angels in downtown Los Angeles, during the opera's run. The exhibit was planned in association with the California Art Club, of which I am an Artist member. My husband was the model for Wotan (he doesn't have a long beard, however.} See more of my portraits on my website.